Six-Pack Challenge WEEK 10 – The Greatest Streak Evah! 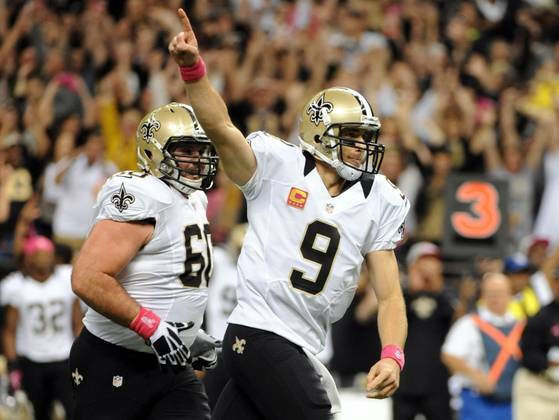 If you’ve watched a Saints game recently, you know that Drew Brees has the record for the most consecutive games with a touchdown. It’s a nice stat for an exceptional quarterback, but that’s all it is. A stat. I know it was a record that stood for a long time and he beat out Johnny Unitas for it, but I swear if I hear one more announcer make it sound like it’s some sort of magical accomplishment up there with Favre’s all-time TD record or Cal Ripken’s streak, I’m gonna smack a brother up. The goal of football is winning games, whether you score points through the air or on the ground. Unlike baseball, where except in certain circumstances hitting a home run is the ultimate outcome of any play, football is totally different. I would’ve taken any other team besides the Chargers against the Bucs this week. The worst thing about this year’s Chargers is that they’re boring. Even when they were underachieving in previous seasons, they were somewhat interesting. No more. This game could so go in a million different directions so I’m going home field advantage. Forget the TD streak. Drew Brees’s best work this year has been in his Pepsi commercial with One Direction. Seems a little low, but you never know with these two teams. While it figures that Atlanta will lose at least a game or two this season, and while this seems like a reasonable spot to expect that, the New Orleans defense is just so bad. Since they have the “pedigree” to go 19-0. The refs should throw a flag on the 12th man in this one. The opposite of Ivan Drago when they have home field advantage. Seattle has a bye next week, so I’m still sticking with the “teams don’t cover before a bye week” theory. Don’t look now, but Russell Wilson and the Seahawks offense are improving rapidly. Russell Wilson is too goo right now and the Jets are too bad. Can’t wait to see how Jason Garrett screws this one up. The freefall continues for Philly. I hope I got 5-1 again because of this damn game. But I don’t feel good about this pick. Both teams coming off a bye week but SF also at home and with a big win in week 8.